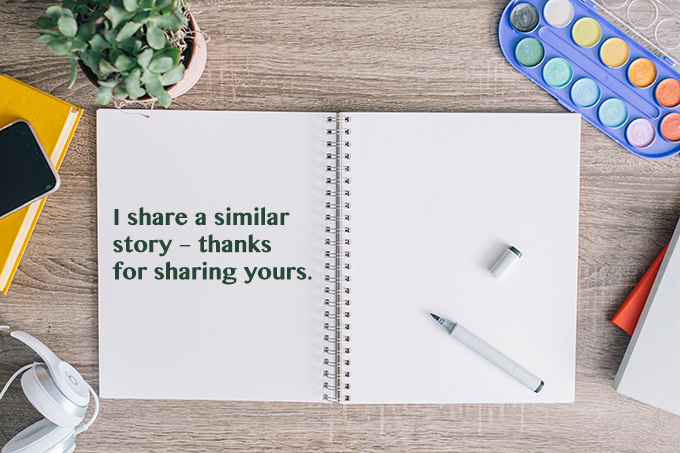 I share a similar story – thanks for sharing yours. That was the subject line of the email she sent. I blog about finding beauty in life, no matter what the circumstances might be, and healing via food and lifestyle vs. drugs and medication. I live with autoimmune colits, infertility, a low thyroid, SIBO and adrenal fatigue. They are a part of who I am, but they do not define who I am. I believe in holistic healing, real wellness and living a life worth inspiring others. My blog comprises all of these things and taglines: When gravel roads are all you’ve ever known, you learn to find beauty in the dust. So when I received her email, my arms rose with goosebumps and a thick lump swelled my throat. I never asked God for many of the things listed above in that “bio.” And yet, so very often, I’ve silently thanked him for unanswered prayers. Yesterday was one of those days. Her email went like this…. Thank you so much for sharing your story! Your blog was sent to me just recently at a very pivotal time in my life. Our stories are almost identical. My gut too was destroyed by the modern diet, antibiotics, etc. and I have been on a Paleo-ish diet myself for the past six years. This led to leaky gut syndrome, systemic candida, you name it, and it has taken me years to finally get to a place where I feel healthy again. Fast forward to this past year where my husband and I have been trying to conceive. After a few miscarriages, it is determined that we will probably not be able to get pregnant on our own. I was devastated by this news and had to grieve for what could have been. We have been praying about IVF vs. adoption. As you know, this is a very hard decision, but with my past health challenges and the fact that I am anti-drug as well, I did not feel at peace with going the IVF route. I have recently been praying for God to give me a final answer in the path we should take, when my step-mom stumbled upon your blog and sent me a link. Talk about an answered prayer!! My husband and I spent all afternoon pouring through your blog, crying and realizing God’s hand in it all. As of today, we have officially put in an application to start the adoption process here in Michigan and canceled our appointment with the fertility clinic for next week. I know God has called us on the path to adoption and we are praying for our child, who ever he or she may be. So thank you for sharing your journey and your struggles. I am sorry for what you have been through, but am overjoyed for you that you have your little girl! We are praying that your adoption will be finalized soon! And then I receive an email like this. I know the Lord is hard at work in my life in helping me see that even when I fall if I share, the fall has not gone to waste. I will never stop sharing my stories.